CPL Lens (CircularPolarizedLens)- Glass reflection can ruin your pictures. Be able to take pictures from inside of a window or a water surface, to darker the sky and increase or decrease haze or color with the most wanted cell phone lens. Suitable to be used on any type of device our Venyn Lenses can be the ideal gift for any photography enthusiast. When you will use the macro lens for shooting at the beginning it is normal to become blur, you need to put your lens very close to the object, the distance to be 1-4 cm, in this mode the phone lens can be achieved focus. Don't forget to detach the macro lens from the wide angle lens. Take off your phone case. 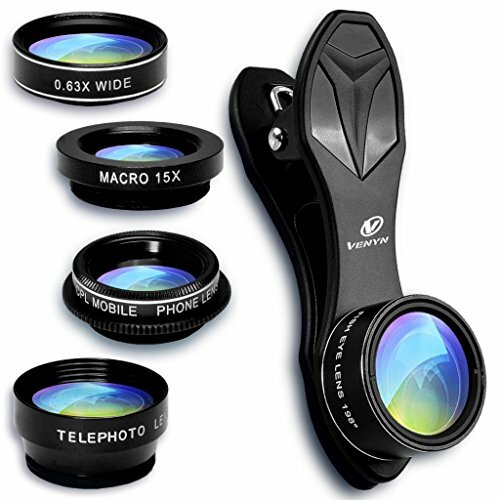 ▲ 1 Macro&Wide-Angle Lens 2 in 1. The macro and wide angle lenses are screwed together. ★MULTI-FUNCTION OF LENSES: 198° Fisheye Lens for Android and iPhone for incredible circular, hemispherical effect photos. 15X Macro Lens for very sharper close-ups. 0.63X Super Wide Angle Lens help largely expand the field of view and enable you capture the entire family or a group into one picture. 2X Zoom Telephoto Lens for smartphone, can take clear photos of long distance. CPL-Circular Polarized Lens designed to eliminate the glare from reflective surfaces and increase contrast. ★BEST LENSES FOR TRAVEL AND BEST GIFT - A great Cell Phone Lens with a very easy to carry portable case. You will get a complete Phone Camera Lens 5in1 kit, perfect for traveling or to give it to a loved one. Photography will be more easier with our lenses 198° Fish eye Lens, 0.63X Wide Angle Lens and 15X Macro Lens, 2X Telephoto zooming lens, CPL Lens. With our VENYN 5 in 1 phone lens kit you can transform the photos into professional ones and create best moments and memories! ★ USE GUIDE & 100%SATISFACTION CUSTOMER GUARANTEE: The Macro Lens and the Wide Angle Lens are screwed together. When you use the Wide Angle Lens, please DO not detach the Wide Angle Lens from the Macro Lens. We provide friendly lifetime customer service and if our phone camera lens kit does not meet your expectations, contact us within 6 MONTHS and we will make you a full refund! Get your 5 in 1 Cell Phone Camera Lens Kit today with no risk! If you have any questions about this product by Venyn, contact us by completing and submitting the form below. If you are looking for a specif part number, please include it with your message.